The Spin R3 comes from the company that is known for its’ spin bikes having created the original one. This bike is a home version of the style of bikes that they have created for gyms. It has many of the same features but made for home use where there is likely to less demands on them than at the gym. To that end the bike is smaller, has a lighter flywheel and lighter build overall making it similar to other bikes around the same price point. This does make it a more affordable option for training in the home rather than spending monthly fees for a gym membership or spending over $1000 for one of the bikes you find at the gym. In this review we go through all the features to see how they stack up and how suitable it is for the home to get your cardio workouts at the intensity and duration you want. The first thing to look at is how well it keeps steady while you ride hard. The bike is narrower than most at 18 ins but is not too tall. Despite this it seems stable when you ride in or out of the saddle. The frame is made of square tube steel that holds you steady with no flexing or shaking no matter how fast you ride. The 31 lbs weighted flywheel provides a good steady pedal stroke but it won’t feel as strong as you get with the 40 lb flywheels. It does make it a little easier to get it turning but doesn’t pull the pedals through as well as the higher amounts of resistance where you might notice a little slowing of the wheel adding a little stress on the legs. There are levelers under the support bars to level out the bike if you’ve uneven floor. You turn them round until the bike no longer rocks from side to side. The bike can be adjusted to properly fit people between the heights of 4 ft 10 ins and 5 ft 10 ins. The handlebars can be moved up/down and the saddle can be moved up/down as well as backwards/forward to get the best fit for each person. It is quick to do so it allows the bike to be used by more than one person. You can have it set up and ready to go within a minute or so, meaning there is no painful delays getting the bike ready before you start your workout. It has pop pins and pre-set holes for setting and holding the saddle and handlebars in place. You can sometimes find that you can’t quite get them in the right place but it does prevent them from slipping as you workout as sometimes happen with those that use the clamping type arrangement. As the handlebars don’t move forward/backwards, if you have a shorter or longer torso than usual, you might not be able to get as comfortable fit as you like but for most people it should give you a reasonable level of comfort. The resistance is provided by a pad that sits on the top of the flywheel. To increase/decrease the resistance you turn the resistance knob that sits above the pad on the frame. It works directly with the pad giving incremental as well as a quick change to the amount of resistance. It provides consistent resistance so there is no slipping as you ride. It doesn’t have resistance levels marked which is usual for spin bikes. It does make it difficult to set or return to a previous setting objectively as it can only be done by estimation and feel or by testing and taking notes and remembering this as you ride. The pad does wear down through use and will need replacing. This is simple to do with the process described clearly in the manual. Replacement pads can be bought direct from Spinner – they don’t cost too much. The chain drive provides an outdoor bike experience as you pedal. You do need to lubricate and adjust the tension from time to time as you do with a bike chain. This is simple to do and can be done by most people without specialist skills. It has a direct drive where the flywheel and pedals move in sync with each other so there is no ability to coast for recovery. When the flywheel is turning so are the pedals. The pedals can be stopped by gently pushing back on them or pushing down on the resistance knob to use as a brake and stops them instantly. The pedals comes with toe cups for athletic shoes. They don’t have straps to tighten so you shoe may feel loose as you pedal and make it harder to pull round the pedal stroke. You also need to be more careful that your feet don’t slip but this is no different to an outdoor bike. You Q-Factor of the pedals – the distance as measured between the pedals is 155 mm. This is important in keeping your legs more aligned for a more natural feel to the pedaling – you don’t feel like you are riding a barrel. The better alignment it provides also reduces the possibility of damaging joints as there is less stress and strain on them. Noise. There is some noise from the chain and resistance pads when it properly adjusted and the manual has troubleshooting tips if either are making a lot of noise. You shouldn’t disturb other people in your home sitting in another room. But it noise is likely to be an issue such as if you want to workout early in the morning when other are asleep you may want to consider a bike with a belt drive like the Sunny Health and fitness Belt Drive. See review here. Seat. The seat is described as an ultra-comfortable sport saddle which means it is wide and padded. You may like it or you may not especially at the beginning. If you’ve not done much riding you are more likely to find it uncomfortable just like you would any bike seat. This a very personal thing. If you do find you can’t get used to it you can try a gel seat cover, padded bike shorts or you can replace it for another standard size bike seat that might be more to your liking. Handlebars. The handlebars are designed for the spinning hand positions with the bull horns and small loop in the center. They don’t come with drop bars or a loop for aero position. They have been coated for safety, grip and comfort. They’re not padded so if you intend to lean on them you’ll find your arms start to ache fairly quickly. Dust and Dirt. The bike doesn’t give off too much dirt and dust but you’ll get some from the chain dropping lubricant and dust from the resistance pad as it wears down. Sweat is likely to be the biggest cause of concern as it will drop on the bike and the floor causing corrosion and gumming up the works. It is important to clean the bike. The best way to protect the floor is with a rubber exercise mat. The bike is compact at 44 by 18 inches. This will help in storing it out of the way not in use where you’ve the space or against a wall if not. It is a good piece of fitness equipment generally if you are tight for space although when you are using it you probably need at least 1 – 2 ft on all sides for safety. It has 2 small transport wheel at the front that you tip the bike on to when you want to move it. They hold the bulk of the bike’s 94 lbs weight leaving you to wheel it to where you want it to go. They work best on hard surfaces and should be fine on most carpet as they are exposed so shouldn’t jam up. The only thing you may want to be careful of is on wood floors as they may scratch or dent it. There is some assembly. It normally takes less than an hour to complete as the bike comes partly assembled. The instructions are clear and the tools needed to complete the job are included. You are required to add the stabilizer bars, pedals, seat, adjustment poles and the handlebars to the frame. It is much easier than putting together kitset furniture. It does weigh over 90 lbs so you may want help with moving the package to where you want to assemble it, taking it out of the package and then holding the frame in place while you add the stabilizer bars. The bike doesn’t include a console which is the usual situation with spin bikes. Many people don’t want one so it isn’t seen as a negative – they use the bike as is, using their own estimate and/or music and workout DVDs to get the level of intensity they want. However, if you are like me and like to see how you are doing you can attach a bike computer like the ones made by Cateye to the bike to give you some basic information such as cadence, distance , calories and time. You do need to make some modifications to the bike computer to fit the bike – in particular the spoke magnet in getting that on to the flywheel (there is help on how to do this on other spin bike on YouTube). As is normal with spin bikes there isn’t a lot in the way of accessories but it does come with more than most. It has a gravity held water bottle holder which is great for grabbing the water bottle and getting it back quickly without having to break your pedaling. It is easy to reach on the frame. There are a couple of issues where it situated. When getting on and off the bike you need to be careful that you don’t kick it with your foot. Also it is likely to get wet from sweat as it is a sweat zone depending on how much you sweat. There are currently no customer reviews for the bike to see how it has performed in the home. I guess some comfort can be taken from the fact that there aren’t any negative reviews as people are more likely to leave one if they’ve had a bad experience. Spinner’s (the supplier) other bikes on the whole have positive ratings from customers and their commercial bikes are among the most popular in gyms. This bike is priced about $100 more than the Spin R1 and for this you get a guard for the flywheel and metallic silver powder coated frame. It is probably a little pricey compared to other similar bikes when just comparing features but you are getting proper spinning handlebars and that the company has been around for a long time making these bikes with a strong reputation for quality so they know what they are doing. When I checked on Amazon you could get it with free shipping and it qualified for Prime. 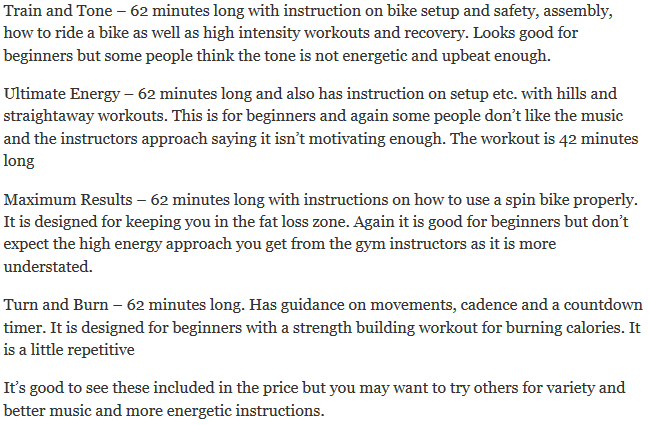 This is a good spin bike for beginners and those wanting moderate exercise. It can be used by those who want long training rides and intense spinning but they are likely to find it a little lightweight than they are used to or want. It comes with 4 DVD with workouts and guidance are great for getting started in spinning. It’s adjustability helps to get the bike to cater for a range of sizes although it would be better if it catered for a wider range. I’d prefer it if it had a basic console at least to help you keep on track during workouts and also to monitor progress but it’s not essential and many people don’t want one. Overall the Spin R3 provides a good stable platform with the ability to quickly adjust resistance helps you to get a good low cardio workout for your fitness level. 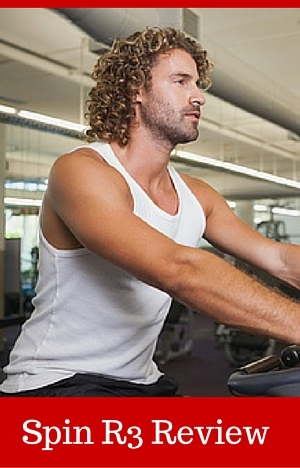 And it can be used by various members of the family to work on their fitness goals. Do you have any knowledge of BH Fitness brand and more specifically their Spada Racing bike (with dual kit, but that is just additional electronics, I’m trying to figure out if the built quality is good enough). Thanks. I’m sorry, unfortunately I don’t have knowlede on the BH Fitness Spada Racing bike. I’ve just had a quick look online. It looks like it could be a very good bike.